and it is amazing to think that, if he were still alive, Freddie Mercury would probably still be making music. He died on 24th November, 1991 aged only forty-five and it was a huge loss to music. I remembering discovering the news and was genuinely shocked. I was not aware Mercury was ill and had AIDS. Back in the 1980s and 1990s, there was less knowledge and conversation regarding AIDS; the mortality rate was higher and many people hid their disease through fear of judgement and hatred. Now, we have come a long way and, in a strange sense, it is people like Freddie Mercury who helped raise awareness. 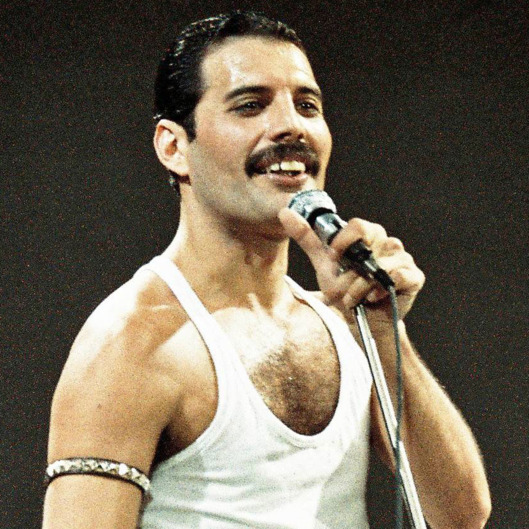 Mercury died of bronchopneumonia – complications of AIDS – and, before he left us, changed the world of music. Tributes are being paid around the world for the Tanzania-born, Queen-helming legend. The frontman once spent time as a baggage handler so, wonderfully, fans have converged to Heathrow and have treated commuters to some dancing and unique showmanship! I guess we are going to see a lot of charming, flamboyant and colourful tributes to a man who, through music, was an explosion of sound and personality! You only need look at a typical Queen video or one of his epic performances – none come bigger and more memorable than Live Aid in 1985 – and you get a sense we will never see the likes of Freddie Mercury again! My favourite Mercury vocals, oddly, are from two very different albums. His Mr. Bad Guy solo record (released in 1985) spawned the single, Living on My Own. It is the 1993 No More Brothers remix that brought it to my mind – exposing the best of his voice and adding more punch and dance the original! I am hooked by that track and love the way Mercury performs on it. His masterful duet with Montserrat Caballé, Barcelona, is among the finest vocal performances ever! Barcelona is from the 1988 album of the same name and, to me, Mercury is the one who shines. His passion, intensity and skill blow me away. Considering he was paired with an Opera singer and someone used to this kind of challenging song; he takes the bull by the horns and nails it! Those sort of performances were hardly unusual. Look how he duels with David Bowie on Under Pressure! Having those icons trade lines is a match made in Heaven and, yet again, it is the Queen lead who wins that battle. It was not all about power and a gust of hurricane when it came to Mercury. He could do more sophisticated and tender moments – tracks like Love of My Life (from 1975’s A Night at the Opera) are spellbinding in their gentility and raw emotion. Whether powering his voice to space or playfully turning phrases and cheekily winking; there was nobody with the same talents and abilities as Mercury. “There’s no way to compare to him. It was always my hope that audiences would understand that I’m up there just excited to sing great music that everyone knows”, he admitted”. “If there’s one fashion element Freddie is best known for today, it is, without a doubt, his yellow military jacket. Having done away with the satin blouses and leather trousers by this point, Freddie instead opted for a minimal look in which one statement piece was the focal point. Instead of going for a military vibe in olive green, or even the sorts of bandsman jackets favoured by Jimi Hendrix, Freddie went with a bright yellow jacket, which, when paired with his oversized belt, gave him the air of a comic book superhero. Behold, the Mighty ’Stache! Gunpowder, gelatine, dynamite with a laser beam, et cetera, et cetera”. The man knew his way around a wardrobe and, whether dapper and snazzy in something smart of really glamming it up; Mercury was a true character and icon that did not easily blend into the crowd. I feel modern artists and band leaders need to take from him and embrace their inner-Freddie Mercury. Gone are the days where David Bowie and Bryan Ferry captivated with their unique style. We have modern Pop artists who have a sense of fashion but none that transcend the ordinary and create their own niche. Another reason it is sad Freddie Mercury is no longer with us is because of the energy and excitement he put into music. Whether you are a Queen fan or not; few can argue against the man’s stage presence and voice. Look at the way he commanded the massive audience at Live Aid – getting them all to sing along and clap; no mean feat considering the vast sea of faces! Maybe he was a more reserved person away from the spotlight but, when the music started, he was this animal that was ready to attack! Mr. Fahrenheit was an explosive, red-hot performer who could transfix any crowd and turn in truly spectacular performances. I was only eight when he died so did not have the chance to see him perform live. I would have loved to have caught him strut his stuff and see how those Queen record came to life on the stage! Queen are that divisive band and some consider their music to be too camp or lacking any real substance. I do not think anyone can deny the gravitas and genius of Freddie Mercury. The reason so many love Queen is because of Freddie Mercury. Could you imagine anyone else performing back in the day?! Adam Lambert does a great job now but one could not have an average or ordinary Pop singer fronting Queen when they formed. In a way, Mercury is the essence of Queen – band members like Brian May helped bring the songs alive but it is that voice we all get drawn to! Maybe there was some drama and tension in the band at times – various biographies and books have revealed some frosty moments and Mercury storming off – but the music shines bright. I am not a huge Queen fan myself but was always interested in them when growing up. Mercury, as a songwriter, could create huge, world-beating songs like Bohemian Rhapsody or something a bit more restrained. Listen to tracks like Bicycle Race, Don’t Stop Me Now and Killer Queen and Mercury steals and defines every eccentric and wonderful word! He brought songs to life and put everything he had into them! I have compiled a ‘best of’ collection of Freddie Mercury-fronted songs that show you his range and incredible talent. Perhaps the songs, at time, were a bit cheesy or odd but that was Queen: never a boring band who was writing the same stuff as everyone else. I love their classic cuts but have a lot of time for their lesser-heard album tracks. At the front was this incredibly charismatic and impressive figure who transformed music.